Each time you get on your horse, get in the habit of just sitting there, relaxing for half a minute or so. Drape the reins loosely around your horse's neck, one of your hands holding the reins there against his mane/withers. Slouch down and take a moment to enjoy the view. Breathe deep and listen to the birds, check out the coming sunset or plan out your next home improvement. When thirty seconds tick by, pick up the reins and ask your horse to walk off. This is especially important if you're running late or in a bad mood. Keep your horse's attitude in check - and prevent mount-up problems with this how-to guide from John Lyons Trainer Keith Hosman. Why the pause? Because forcing yourself to "cool it" for a bit will force you into neutral and away from the "go go go" you might be feeling after rushing to the barn and tacking up. Rather than barging into things (and perhaps taking "things" out on your horse), establish a rhythm and pace for your ride that's calm, rational and thought-out. You're not simply "trying to get this over with." And, do this because you don't want your horse in the habit of moving off on his own. After all, what's the point of going out and working on brakes or speed control - when your horse began the session by ignoring this very thing? If your horse is already in the habit of walking off as you mount up, then he's either scared (most likely of your hands and how you use your reins) - or he's disrespecting you (or both). Allowing your horse to call the shots in such a way eats away at any respect you might have gained previously and often goes from bad to worse. The first time he tries this, you can simply back him up a few paces and give him another shot at standing still. If he doesn't learn to stand "right quick," then allow him to walk off - and work him intently (serpentines, diagonals, speed control - anything) for twenty full minutes before giving him the option to stand again. Make him see that standing is a better option. Also, get better with your hands. You may very well be applying pressure to his mouth (too much or at the wrong times) without realizing it. Watch yourself (or have a friend/trainer watch you). Study your pick up and release of the reins and see if you can't back off on all that pressure. Nutshell: Get on your horse and sit there for thirty seconds because it sets your overall pace and because it objectively proves that the horse is waiting for your command not "taking over." If he moves off, work intensely for twenty minutes and give him another chance to stand. Also, make an effort to get lighter with your hands, releasing sooner. 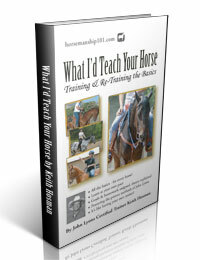 The article above is an excerpt from my book "What I'd Teach Your Horse: Training & Re-Training the Basics." Get it: eBook, paperback - and even audio! ﻿﻿If you broke your horse to saddle and rode it for the first time today, this book is where you'd start tomorrow. Likewise, if you have an older horse that needs re-training, you'd start here. This book is a roadmap to building the foundation every horse needs, regardless of age, breed or background, regardless the type of riding for which it will eventually be used.